The team at Crown Dental Group in Rowville are here to help you keep your pearly whites, pearly white for longer. The staining and yellowing of your teeth do not happen immediately. It’s a process that starts as soon as your teeth erupt and never really stops even after a whitening procedure by a dentist. Food particles, sugar and unhealthy oral habits, like smoking increase the risk of your teeth becoming decayed and discoloured. Although tooth discolouration seems inevitable there are some habits you can take up to maintain your shiny white teeth, extending the time between whitening appointments and keeping your mouth healthy and clean. Oral health may start with brushing twice a day but there is a lot more to keeping your pearly whites, pearly white. With a growing number of toothpaste brands entering the market and claiming to be the best, it is hard to know which toothpaste really is the best for your teeth. And while the adverts and the packaging all seem to be claiming the same thing, the real way to tell if your toothpaste is the best for you is to check the back of the packaging where the active ingredients are listed. Although whitening is important, it is not the most important function of a toothpaste for everyone. For example, if you have sensitive teeth or gums, excessive use of peroxide (a bleaching ingredient in many whitening brands) may increase the sensitivity of your teeth; while fluoride which strengthens tooth enamel and contributes to preventing tooth decay may be on your list of priorities. Contact us and set up a dentist appointment for a general check-up and advice for healthier and whiter teeth. Tooth decay is caused by acid-producing bacteria which target the food particles in your mouth. It is almost impossible to reach the tiny crevices in your mouth with your toothbrush. Whereas flossing cleans out the hard to reach areas between your teeth reducing your chances of tooth decay. Flossing after brushing your teeth ensures your mouth is clean and that no food particles are trapped between teeth. Smoking is addictive. Not only is it harmful to your general health, smoking is also harmful to your teeth. Smoking causes tooth discolouration and in some cases tooth sensitivity. Smoking also decreases your mouth’s ability to fight harmful bacteria making them more susceptible to plaque build-up and tooth decay. Although dentist visits are generally a bi-annual event, smokers are advised to visit the dentist more often since their dental health and aesthetic appearance of their teeth are at higher risk. Red wine, beetroot, chocolate and coffee are among the highest tooth-staining foods because of their natural colour and ability to stain. Although these foods are okay in moderation, a diet high in darkly pigmented foods could lead to a quicker reversal of tooth whitening treatment and tough stains. While food stains can be removed from the teeth by teeth whitening treatments, darker stains may require longer at home whitening treatments or more aggressive in-chair whitening by a dentist. Rinsing your mouth regularly can decrease the time food spends in your mouth feeding bacteria. Regular mouth rinsing even with regular clean water can reduce your risk of tooth decay. This cannot be reversed by teeth whitening and may require reconstructive dentistry and in the worst cases of tooth extraction. Plaque build-up starts as soon as the teeth have been cleaned. Although carbohydrates eventually convert into sugars, sugary foods are immediately consumed by bacteria which produce tooth-decaying acids. A bedtime snack after you’ve brushed your teeth is damaging to your oral health. While you sleep the bacteria works to destroy your teeth for hours before you rinse your mouth or brush your teeth again. Teeth whitening is a popular cosmetic treatment in various forms. 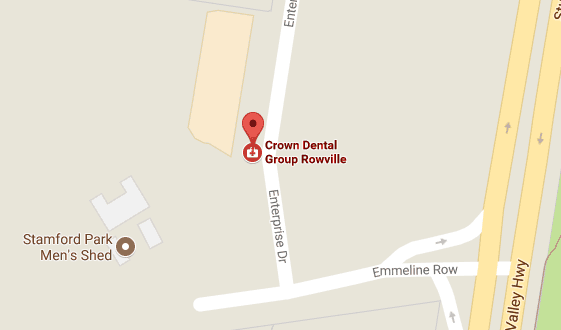 The Crown Dental Group in Rowville offers both in-chair teeth whitening performed by a dentist is less than an hour and at-home Zoom! Whitening which can achieve great results over a number of days in the comfort of your own home. The Crown Dental Group also performs general dental maintenance and reconstructive dentistry to keep your teeth in good health. As well as professional interventions to help you achieve the smile and level of dental care you’ve always wanted. Contact us today to book your appointment and begin your journey towards a healthier, more beautiful smile. Follow us on Facebook for specials, news and tips on how to keep your teeth healthy clean and white.